To avoid early OS bugs, Palm OS version 3.5+ is recommended. (and file CondMgr.dll sometimes required in the Windows\System directory). It fixes various OS problems that can affect Auriga. Attention: It seems that on some Palm TX, not all, the Bluetooth controller has problems with waiting between data messages, and that some measures taken with the DistoX never get received by Auriga; try it before you buy one! For computing large caves or networks, the Palm Tungsten T3 remains the fastest device thanks to its 400 MHz CPU an its (volatile) RAM much faster than the non volatile memory (NVRAM) in newer models. In August 2010, Aceeca introduced the PDA32, a semi-rugged Palm TX equivalent, but with a double capacity battery (229 $ with IR and Bluetooth). Advices: A Palm IIIxe is an interesting dirt-cheap choice: this robust device can be had for less than 20$ on eBay, yet its monochrome screen with 16 shades of gray is the best of the III series (others are greenish with 4 shades) and it features an upgradable ROM that can be reflashed to Palm OS 4.1. In Mexico, its 8 Mb of RAM would easily hold our 29 caves totalling 5200 survey shots (and 45 km). This memory was just barely below the limit to display the whole network at once, but smaller ad hoc networks could be built with neighboring caves when a connection was expected. In a month of use, we changed batteries only once. Another interesting cheap device is the m125: a rare combination of color, SD slot and replaceable batteries. If Bluetooth is required, the Bluetooth-enabled PDA32 has the best battery duration among such PDAs (20 hours), the Tungsten E2 is second, but by far. My personal choice? My "city" Palm is a Tungsten TX, but underground I use an Aceeca PDA32. An Android or PocketPC version of Auriga? No port of Auriga towards Android or PocketPC (Microsoft's OS for handheld computers) is considered for the moment. But it is possible to run Auriga under Android or PocketPC in emulation mode with StyleTap. Things work well, up to Bluetooth and access to the internal GPS. Only Palm OS conduits are not supported, but with Auriga's import/export features, it is not a problem. 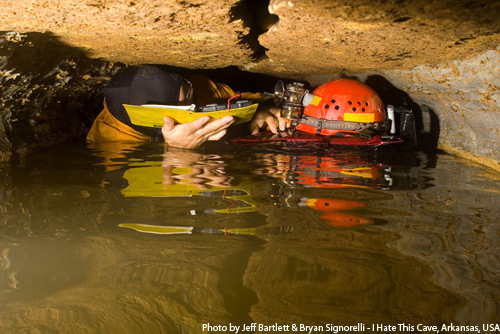 It is possible to keep a PDA dry and clean in a wet or muddy cave by using proper protection, as illustrated here. 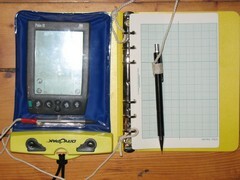 The waterproof PDA case from DryPak (15 $) can be screwed inside a regular survey notebook to allow simultaneous input of numeric data (on the Palm) and sketching (on paper.) Writing is done through the vinyl window, without taking the PDA from of the case. The closure is positionned at the bottom to allow IR beaming. A homemade solution with clear vinyl and a slit tube closure is indeed possible. In a dry and easy cave, a Ziploc may sometimes be enough. Armor offers a water-tight protective case (50 $). It only lacks an easy-to-build hard cover (wood, metal or plastic) to protect the write-through screen.